In ancient Roman society, the male was head of the family held almost absolute powers over his family. This was because ancient Rome was a patriarchal society where women did not have much say in private or public life. Children of ancient Rome were under the authority of their fathers. A father could decide almost everything for his children such as dressing, education and lifestyle. One of the most brutal laws of Rome related to the Roman children was that fathers could even kill their children without breaching Roman law. This practice only changed in the first century AD. The daily life of a child in ancient Rome began with the breakfast which consisted of bread with other ingredients varying depending on the social status of the family. Mornings were generally reserved for the education of the children which was either imparted by the mother or the hired tutor. During the days of the Roman Empire, some children were also sent off to tutors and this became part of their daily life. Girls, however, stayed at home and helped their mother in household chores. Children played various games or with their toys in the afternoon and evening. Some also helped their fathers with work, particularly children from the lower classes. A sculpture depicting Roman children playing. Education for Roman children evolved over centuries. During the early period of the Roman Republic, education was mainly a family enterprise and there were no schools. However, this gradually changed over time and during the time of the late Republic and the Empire a tuition-based education system was well in place. This system of hiring private tutors for education of the Roman kids was inspired by the Greeks. In fact, many private tutors that educated the children were Greek slaves or freedmen. As expected, more emphasis was put on the education of boys than that of girls. The children of ancient Rome spent their free time playing with toys and indulging in various games. Some of the most common pastimes for Roman children were flying kites, playing with balls, and rolling hoops made from pieces of metal so that they chimed like bells when rolled. Boys also played war games with wooden swords and shields. Girls, on the other hand, played with dolls which could easily be made at home. The writings of Horace describe the children of ancient Rome playing games such as riding hobby-horses, building playhouses, and making carts. Children in Roman times played various kinds of games but perhaps the most popular games were related to wars and battles. Warriors had special importance in the Roman society and it was the aim of every boy to imitate warriors and to become like one. Thus war games were popular among boys who made swords and shields of wood and mimicked warlike situations. Other popular games included hide-and-seek and blind man’s bluff. Ball games were played in a variety of ways with the common factor being hitting of a ball with hands or arms which were padded for protection. The typical meal for children was just like the adults, consisted of breakfast, lunch, and dinner. The quality of food and its ingredients varied according to the social class of the family. Bread and wheat were mostly eaten as breakfast while children from more affluent families also used dates and honey. Lunch was eaten at midday and consisted of such ingredients as fish, cold meat, bread, and vegetables. The main meal of the day was called dinner which was simple for ordinary people and quite lavish for the upper classes. 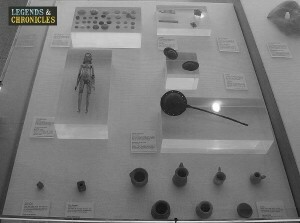 A selection of children’s toys from ancient Rome. There were certain marked differences between the lives of the wealthy and poor children of ancient Rome. Wealthy Roman children enjoyed better education facilities, better food, and better opportunities for entertainment. For example, children of ancient Rome from wealthy backgrounds got their education from hired tutors and were thus better educated than poor children. Similarly, wealthy children of ancient Rome enjoyed more leisure since, unlike many poor children, they did not have to lend a helping hand to their fathers in work. Wealthy families could also adopt children if they had no children or heirs of their own. Poor children of ancient Rome naturally had less social status and enjoyed less privileges compared to the wealthy children. To begin with, many poor children did not receive any kind of education which left them at a disadvantage from an early age. A lot of children from ordinary backgrounds received education at home since hiring a tutor was not affordable for their parents. The diet of poor children of ancient Rome was less healthy and with less variety compared to that of the wealthy Roman children. Finally, poor children of ancient Rome had less career opportunities and options compared to the wealthy children. What clothing did Roman children wear? The most common article of clothing for Romans, children and adults included, was a knee-length tunic which was more or less same for adults and children. Children could wear a cloak over the tunic in winters. Free rich boys also wore a toga with purple borders which displayed their social importance. Girls, on the other hand, wore a tunic and also used a woollen belt which was tied around their waist. For both boys and girls, it was common to wear a charm around their necks. This charm was called a ‘bulla’ and was given to the child when he or she was a few days old. Children in ancient Rome spent the kind of lives which children in any conventional society would. The main components of their lives were education and games. Additionally, children from the poor backgrounds often also helped their fathers in work. Children from well off families were sent to privately hired tutors while most children from common social backgrounds were educated at home. The children of ancient Rome played various kinds of games among which war games were the most important. Boys had relatively more freedom of mobility and education compared to girls.